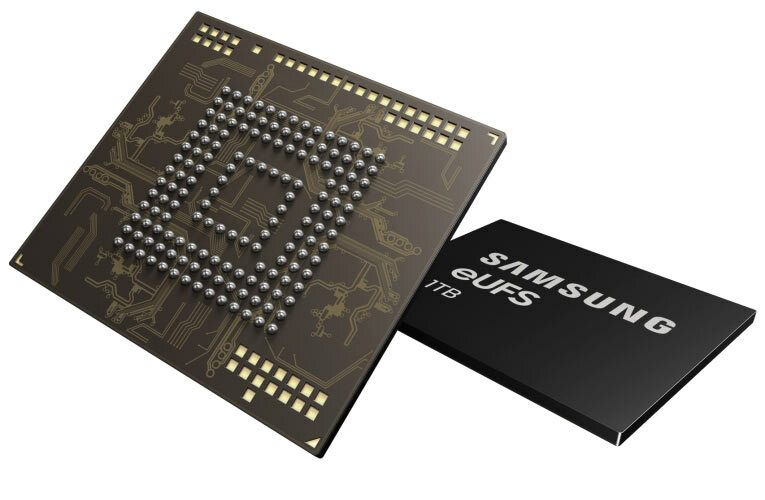 Four years earlier, Samsung Electronics introduced the first eUFS solution (Embedded Universal Flash storage solution) with a 128-GB Flash Storage for mobile phones. Now, considering the demand of storage capacity in premium notebook PC and other mobile devices, Samsung has passed the anticipated terabyte threshold by introducing 1-TB eUFS 2.1 today, which it claims to be the industry’s first. The new One-Terabyte (1TB) eUFS solution combines 16-stacked layer of the 512-GB V-NAND flash memory using a newly developed proprietary controller to achieve a capacity of 1TB. Irrespective of the storage being increased, the package size remains the same of the previous 512GB version with a dimension of 11.5mm x 13.0mm. This huge storage space will now enable users to store high quality videos, for instance the user can store 260 videos in 4K UHD format each video being around 10-minute long. Not only the storage size has been improved, but the 1TB eUFS also has exceptional read and write speed of 1000 MB/s and 260 MB/s respectively. This means that 5GB-sized full HD videos can be offloaded to an NVMe SSD in as fast as five seconds, which is 10 times the speed of a typical microSD card. Random writes are 500 times faster than a high-performance microSD card (100 IOPS), coming in at up to 50,000 IOPS. The random speeds allow for high-speed continuous shooting at 960 frames per second and will enable smartphone users to take full advantage of the multi-camera capabilities in today and tomorrow’s flagship models. Samsung has already begun mass production of its 1-TB eUFS 2.1. Further it has also announced that it is planning to expand its Korea plant by the mid of 2019 to fully address the anticipated demand of its 1TB eUFS. You can visit their website for samples and other information.